Based in Schaffhausen, Switzerland, the prestigious independent watchmaker H. Moser & Cie. has long been favoured by professionals looking for authentic watchmaking craftsmanship and understated aesthetics. H. Moser & Cie. takes pride in making exceptional timepieces that fuse modern and traditional techniques, and even more so in the fact that all movements in H. Moser timepieces are created in-house. The Endeavour Dual Time Special Edition, fitted with the in-house HMC 346 calibre, has been designed exclusively for our retail partner Elegant, in Hong Kong. This distinct design features a case made from grade five titanium with a diamond-like carbon (DLC) treatment, and H. Moser’s first ever matte anthracite dial, sandblasted and plated with ruthenium entirely by hand. This limited edition design comprises just 20 timepieces, available exclusively at Elegant in Hong Kong. You may be wondering if this timepiece has been created to satisfy watch enthusiasts, or more as an expression of H. Moser’s pride and dedication as professional watchmakers. In fact, the idea for the Endeavour Dual Time Special Edition was born during Baselworld 2014, when a representative from Elegant told H. Moser’s senior management how popular the timepieces are among Elegant clientele, with some watch owners boasting a number of H. Moser timepieces. Many of Elegant’s customers, coincidentally, mentioned a desire to own an H. Moser timepiece that combines understated aesthetics with more complex functions (such as a dual time zone display). The feedback from these customers is what drives H. Moser watchmakers to continue to innovate and, as such, H. Moser took this feedback very seriously. H. Moser immediately set about designing the Endeavour Dual Time Special Edition, exclusively for Elegant in Hong Kong. Something that makes this timepiece particularly special is that it features H. Moser’s first ever matte anthracite dial, sandblasted and plated with ruthenium entirely by hand and created for this special edition. Only 20 Endeavour Dual Time Special Edition timepieces will be sold, all with Elegant in Hong Kong. This special edition timepiece shows how H. Moser responds to the wishes of watch enthusiasts, as well as being a fine example of H. Moser’s in-house product development and production capabilities. Unlike the precious metals used in H. Moser’s regular timepiece collection, the Endeavour Dual Time Special Edition has a case of polished grade five titanium (used in very few H. Moser special editions) with a diamond-like carbon (DLC) treatment. Grade five is the highest grade of titanium used in watchmaking. It is not only very hard, easy to wear, hypoallergenic and very light, but it is also the only grade of titanium that may be polished like a precious metal or stainless steel. 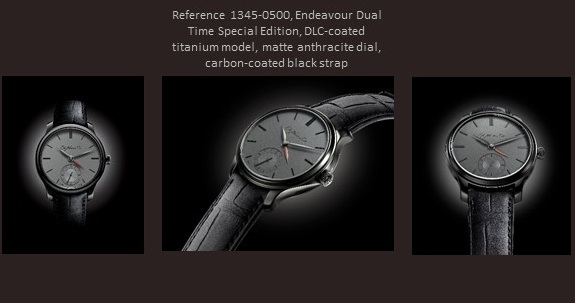 As such, the Endeavour Dual Time Special Edition, like other H. Moser timepieces, enjoys specific finishes and decorations on its various surfaces and edges, including mirror and hairline finishes. The diamond-like carbon treatment gives the Endeavour Dual Time Special Edition an understated and mysterious deep black surface, and it helps protect the case further from scratches, making for a timepiece that is suited to daily use. Set against a modest matte anthracite dial, the hour, minute and seconds hands appear to simply be carrying out their basic function, when in fact they are hiding exceptional H. Moser technology. The Endeavour Dual Time Special Edition, as its name conveys, has a dual time zone function, for travelling around the world and across time zones. A red second time zone hand is concealed underneath the “home time” hour hand. When overseas, you simply adjust the red second hour hand to the new local time. The hour hand for the second time zone moves with the home time hour hand. The patented H. Moser Double Pull Crown can be pulled precisely to the central position without stopping the movement, so the home time is not disturbed. This technology is a classic display of H. Moser’s unassuming master craftsmanship. Another key feature of the Endeavour Dual Time Special Edition is the pawl winding system within the in-house automatic calibre HMC 346. This system is the result of relentless efforts made by the H. Moser product development team during the design and testing this highly efficient automatic in-house calibre, and it reflects H. Moser’s goal of bringing together both fine craftsmanship and practicality. The timepiece also includes Moser teeth for all wheels and pinions, a patented Moser interchangeable escapement, an original Straumann hairspring® with a stabilised Breguet overcoil and a pallet fork and escapement wheel made from solid gold. An 18-carat solid red-gold oscillating weight winds the spring barrel, giving excellent performance and a minimum 3-day power reserve.